Bedroom Interior Tips | emma etc. Simplicity. That is the winner to a nicely designed bedroom. I don't know about you, but for me I want my bedroom to be a simple, relaxing place I can do whatever: paint, draw, read, listen to music, watch a movie, etc. Often the first step is to paint your walls white or a variation of it, and make it your blank canvas. Then you can do whatever, and change it around countless times if you wish. Add a personalised touch. For me, this involves surrounding myself with the memories that make me happy. You can do this with photographs. I like to stick up a selection of polaroids from my FujiFilm Instax Mini 8 and then store the rest in a photo album or journal. You can put up your favourites or most recent, and switch it around so you're alternating the photos your see on your walls and the ones you store away. Or if you like, put all of them up and make a sort of collage out of them. Get creative with how you do it. 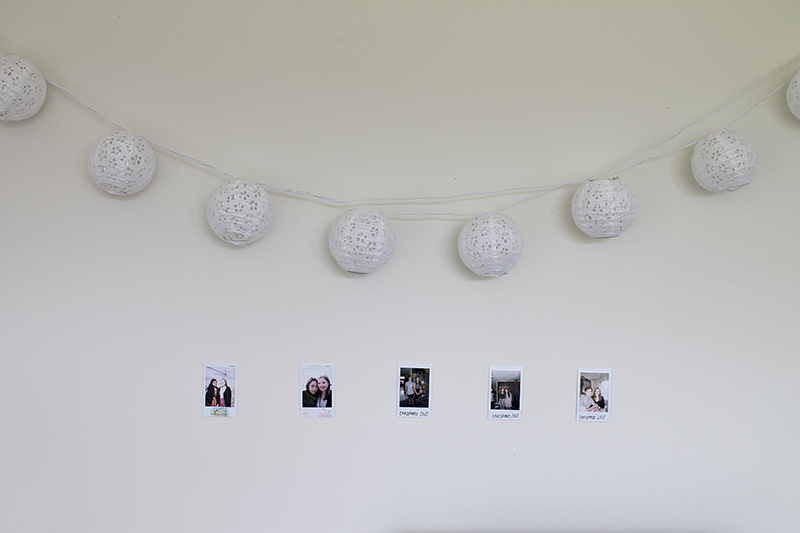 Of course, you don't have to have a polaroid camera to put photos up on your wall. You can use a digital camera or your instagram pictures, print them off yourself or even have your chosen instagram photos ordered. Surround yourself with the things you love. Let this be your own sketches, art and art posters from magazines such as Frankie and Yen, or fashion inspiration from Russh or Vogue. Sometimes you've just got to rip out that one page and plaster it on your wall. I ordered a free catalogue magazine from White Pepper, and ripped out a couple of my favourite looks or photos in it. You may be a little more reserved in what you rip out of such a precious magazine, but if you get something like this you're not doing much damage. The art posters that come in magazines are meant to be ripped out, anyway. You could make a trip to an op shop and scavenge for old issues of magazines. This way you'll have more leniency when it comes to making an inspiration board of sorts for your wall by ripping out pages. 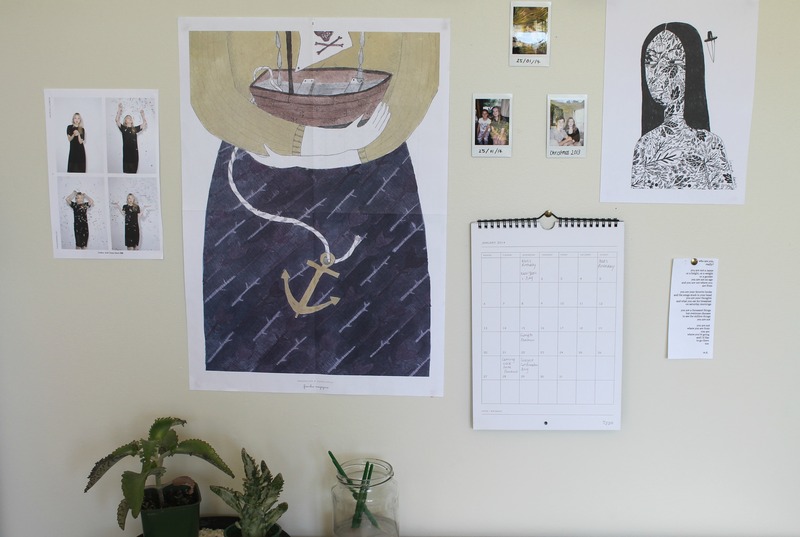 Print out quotes or poems you love and pin them on your wall, even if it's just one, when you're working at your desk you'll get the reminder or inspiration you need. Plants. Bring the outside in with a flash of greenery here and there for your room. Buy a couple of cacti -- get creative with different colours or types, buy a little house plant and watch it grow. You can even get creative with the pots you put your beauties into. Paint them, draw patterns with sharpies on them, try your hand at pottery and make your own, make a gorgeous hanging plant like the one here from Zoe (google some tutorials or experiment in making them). If you're bored, this is a chance to make something for your room that will satisfy you when you're done. Get hanging. Whether it be a cute set of lanterns or fairy lights, or a DIY paper garland, this will add a big feature to your room and make it that extra special. You can make this something to structure your room, so above your bed, above your desk, around your mirror. It can also offer a colour scheme for your room as seen with the cute paper garland, or if you want something a little more simplistic go for a string of lights that make your room look extra cute at night while you're cozied up in bed with a book. Don't forget to be practical. Add a cute calendar to your wall of inspiration so when you're working at your desk you'll have the important dates right in front of you. Get this filled with your school exam dates/assignments/homework deadlines or if you're out of school, fill it with blogging post schedules if that's your thing, birthdays, events -- basically anything. Make this your go to organizer for everything important that's happening in your life. Here's a free download of the wonderful Jasmine Dowling's calendar if you're late to the party in getting one for your wall. thanks for all these tips! im hoping to redo my room this year, and having this list will remind of what i need to put into it once its done! ah your room is so lovely. I'm always wanting to change/improve mine, these tips are fab!